• Companies that aligned sales and marketing generates 208% more revenue from marketing efforts. • Organizations that implemented smarketing see 36% higher customer retention and 38% higher sales win rates. However, there is a sad business-world paradox: a rare company is able to tune such efficient cooperation. marketers have no access to a sales pipeline, that means they cannot plan marketing campaigns for existing customers, but according to the findings, a 5 percent increase in customer retention can increase business profits by anywhere between 25 percent and 125 percent (Gartner Group). Since not every company can afford the luxury of losing profit and customers, it’s a must to provide efficient departments’ cooperation. Luckily, top-notch technologies are an easy way out. 2. Integration set up requires a minimal IT specialists’ engagement, if any at all. 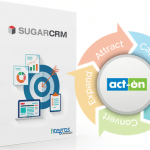 Have any questions on SugarCRM integration with Act-On? Let’s discuss!